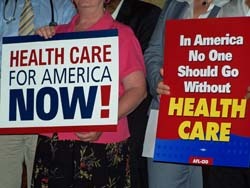 A coalition of public interest, labor, and medical groups want government to enact real health care reforms. They&apos;re calling on state and federal lawmakers to make health care a top priority in 2009, and to commit to guaranteeing access to quality, affordable care. Citizen Action of Wisconsin&apos;s Robert Kraig, one of the over 100 partners in the nationwide campaign, says too many people can&apos;t afford medical treatment or are being denied coverage by insurance companies. He says the system is broken to the point that even those who pay for insurance and do what they&apos;re told are frequently denied treatment or dropped when they get sick. The coalition is asking lawmakers and candidates for office if they will work towards reforming the system. Kraig says they need to be on the side of the public, not insurance companies. Kraig says everyone should be guaranteed the care they need to survive.